Bird burst on the scene in 2015 when he came up late that season and hit 11 home runs in 46 games. Ever since then, it has been a struggle for Bird to stay healthy, starting when he missed the entire 2016 season recovering from right shoulder labrum surgery. In 2017, Bird was limited to 48 games due to a right ankle injury he suffered in spring training and then various ailments throughout the season. He hit .190 (28-147) with 9 home runs and 28 RBI. 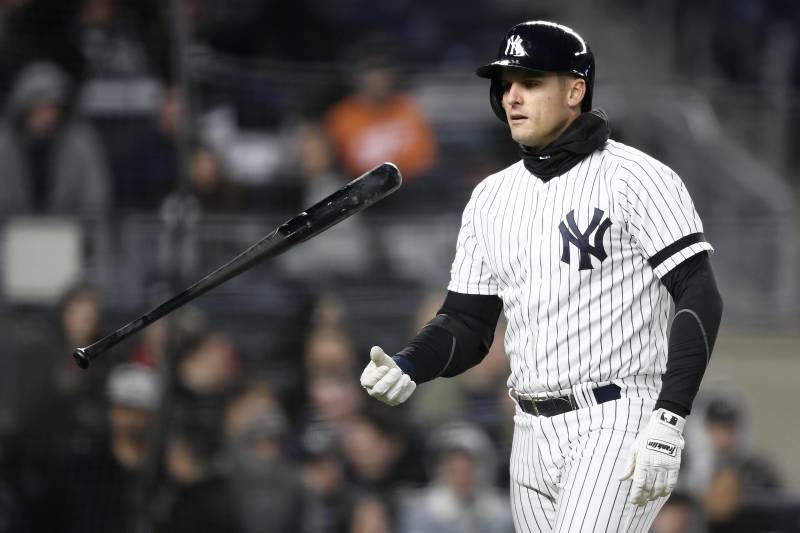 Bird was healthy for the 2017 playoffs, and he had a big moment when he hit a game-winning home run against Cleveland's Andrew Miller in Game 3 of the ALDS, starting a Yankees' comeback from down 2-0 in that series, which they won in five games. In 13 playoff games, he hit .244 (10-41) with 3 homers, 6 RBI, 5 runs, 12 walks, and 2 doubles. 2018 was a rough year for Bird, as he missed the start of the season due to ankle surgery and was supplanted at first base by midseason acquisition Luke Voit. In 82 games, Bird hit .199 (54-272) with 11 home runs and 38 RBI. During spring training, the Yankees couldn't decide on who would get the nod at first base between Bird and Voit. The season opened with both of them on the roster, with Voit primarily acting as the designated hitter while Bird played the field. With Bird heading to the injured list once again and his presence at the plate not what it was, the Yankees have a real tough call as to whether they stick with him moving forward. Yankees General Manager Brian Cashman has always taken pride in Bird, one of the vaunted "Baby Bombers," along with Aaron Judge and Gary Sanchez, who came up in 2015 and '16. After last season, Cashman acknowledged the fans' frustration with waiting for Bird to be healthy and live up to his potential. There was some thinking that he would be moved in the offseason, but he was given another chance this season. The question now is if Bird can make the most of this season after he returns or if it will be another injury-riddled campaign. Taking Bird's place for now will be Mike Ford, who was called up on Tuesday morning from Triple-A Scranton/Wilkes-Barre and signed him to a Major League contract. A Belle Mead, New Jersey native, Ford has been in the Yankees organization since he was signed as a non-drafted free agent on July 17, 2013. He started his professional career with short-season Single-A Staten Island in 2013, then in 2014 he played at the next two single-A affiliates, Charleston and Tampa. In 2015, he played at Tampa, where he was a Florida State League Mid-Season All-Star and ranked fourth in the FSL in walks. In 123 games, he hit .260 with 6 home runs and 55 RBI, and 62 runs scored, with 23 doubles and 3 triples. In 2016, Ford split time between Tampa, Staten Island, and Double-A Trenton, and then 2017 was split between Trenton and Triple-A Scranton/Wilkes-Barre. In December 2017, he was selected by the Seattle Mariners from the Yankees in the first round of the Major League phase of the Rule 5 Draft, and then was returned to the Yankees in March 2018. In 2018, Ford played 102 games at Scranton/Wilkes-Barre, where he hit .253 (93-367) with 15 home runs and 52 RBI, with 48 runs scored and 21 doubles and 37 walks, along with 70 strikeouts. He closed the season with six games at Staten Island. At Scranton/Wilkes-Barre this season, Ford played 10 games and is hitting .410 (16-39) with 5 home runs and 14 RBI. ELlSBURY: In a sign that the Yankees are not planning on having outfielder Jacoby Ellsbury back anytime soon, the Yankees transferred him to the 60-day injured list with no reason given.